Enjoy sun and fun by the beach at this tranquil oceanfront resort. Take a break from the hustle and bustle of daily life, and relax in comfort and luxury at Sandcastle South Beach. After a day of sightseeing or shopping, unwind by one of the indoor or outdoor pools, or take a soothing dip in the Jacuzzi. Kids can splash and play in the kiddie pool, or go adventuring in the playground. Sandcastle also features great dining options, from Ocean's 22 Lounge to their seasonal cabana bar and Sandcastle South CafÃ©. 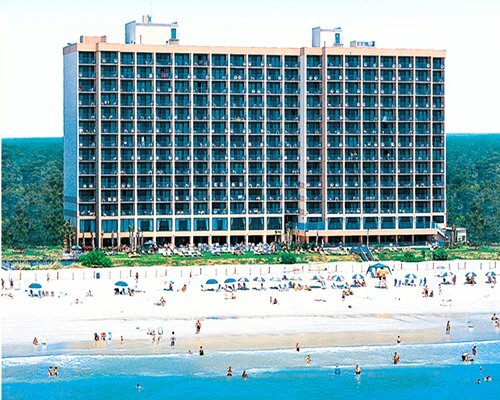 Relax in comfort and style at the Sandcastle in Myrtle Beach. Each of the spacious air-conditioned rooms features full kitchens – complete with microwave oven.This resort offers studio units which sleep four, and one-bedroom units which sleep six. These quiet and comfortable rooms will make families feel right at home during a stay in Myrtle Beach. Wake up to gorgeous sunrises and frolic in the dappled blue waves of South Carolina's resort capital. Myrtle Beach is brimming with exciting attractions that are fun for the whole family. Plan a trip to Alligator Adventure, to see one of the largest reptile facilities in the world. Kids will love the Children's Museum, where they can learn about the world through several interactive exhibits. Myrtle Beach is also renowned for its shopping districts, so make sure to visit Barefoot Landing or Broadway at the Beach, two venues that feature a myriad of shopping and dining opportunities. The resort islocated 3 miles from the Myrtle Beach International Airport. From the airport, turn right onto Jetport Rd, then right onto SC-15. Turn right onto 17th Ave S, and then turn right onto S. Ocean Blvd. The resort is on the left side of the road. "Housekeeping fee for all RCI points reservations: There may be a fee of 17.00 U.S. dollars for Studio, per stay. Cash or Credit is accepted." "Housekeeping fee for all RCI points reservations: There may be a fee of 25.00 U.S. dollars for 1 Bedroom units, per stay. Cash or Credit is accepted."